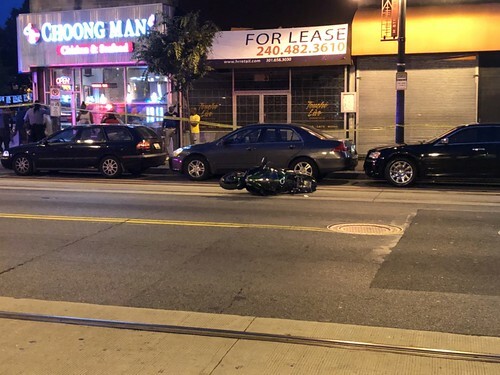 On Friday a judge sentenced the driver who struck and killed 53 year old reporter Oren Dorrell on H Street NE on June 8, 2018. In accordance with a plea deal to voluntary manslaughter, 47 year old Daryl Grant Alexander was sentenced to six years in prison, followed by five years of supervised release. Alexander, who admitted that he had consumed alcohol and smoked PCP prior to hitting Mr. Dorrell, was apparently heavily intoxicated and not coherent when police removed him from his car. He originally struck Dorrell in the 1100 block of H Street NE, and Dorrell was still under the car when witnesses stopped Alexander at 13th and H Street NE. Bystanders assisted police (reportedly about twenty people total) in lifting the car off the injured Dorrell, who later died from his injuries. Dorrell, who was wearing a helmet as he rode his motorcycle, had been stopped at a light when Alexander hit him from behind. Because Alexander told investigators that he had no memory of hitting a motorcyclist, or driving that stretch of road, he was allowed to enter an Alford plea. The Washington Post points out Alexander was on probation for a DUI at the time of collision, and USA Today notes that Alexander actually had five prior DUI arrests. I gleaned the above information from The Washington Post and USA Today, which both have stories on the sentencing. Dorrell was a foreign affair reporter for USA Today. He lived with his family in the Trinidad neighborhood. That's a nothing sentence. But it's typical for DC. Had the drunken PCP smoking 5-prior DUI Daryl Grant Johnson been a juvenile he would have walked away with no sentence at all. Instead he gets 6 years. This is the District. A license to kill. Your politicians care more about people from other countries and criminals and people "unwilling to work" You the hardworking taxpayers victims of crime who have to avoid the mentally ill on every block when will you stand up for yourselves? They could close the underpass for months and pay millions for pretty light display, but not an effort to stop the tent people who moves right back in? I'm okay with this sentence. 6 years in jail is real hard time and if you believe the Defendants story, he was so affected by PCP he had no intent or memory. A man is dead, a good man, a decent father and reporter. Should we kill another or should we give enough of a sentence that others are deterred? The penalty existed before he decided to intentionally drive while on PCP so the deterrent doesn't work? He took a life and should be punished for taking a life and for the lives of those in his family who will suffer forever. I am for the victims not the offenders. Last year a young father a bar manager in Woodly park was shot while attending a wedding out of town. He suffered for a week and died and left behind a wife and children. Pat: Why in the world would you think the sentence is a deterrent, in spite of all evidence to the contrary? And why in the world do you think deciding to take strong drugs should serve to lessen someone's responsibility for what damage they do while on those drugs? I will point out that Intoxication is a defense for specific intent crimes. "In some cases, the defense of voluntary intoxication does not completely absolve the defendant of liability but instead reduces the overall culpability for the crime. Thus, the defendant might find charges reduced to a lesser crime if he or she successfully proves that intoxication limited his or her intent or comprehension of the crime."